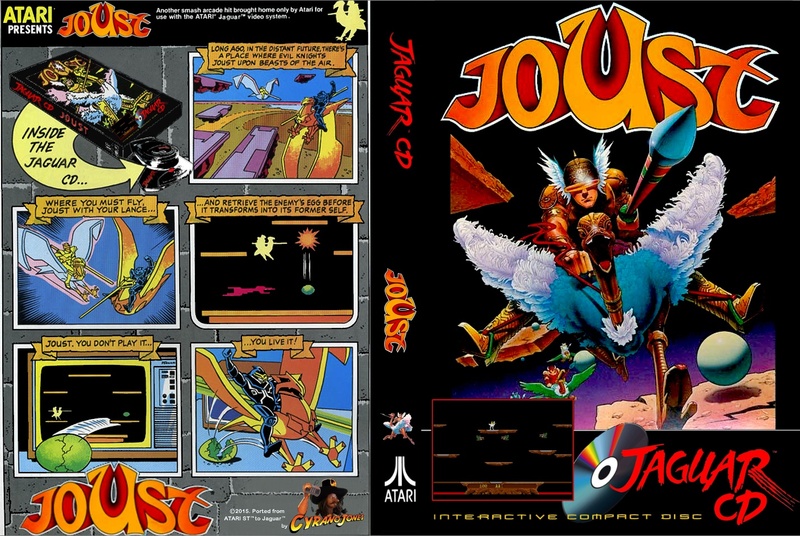 Not quite the powerhouse Dactyl Joust, but still a great game! This only took 20 minutes, so very happy with it! Thank you CJ. I'm a kid again. By any chance CJ you'll take a look at the St's Berzerk. This is great CJ! As for Berzerk, that is one I'd like to see too as simple as that is. Not bad. Is there sound on this one? Ok, just making sure I loaded it right. Thanks for confirming. Atarimania seem to be down, but I do have the game. 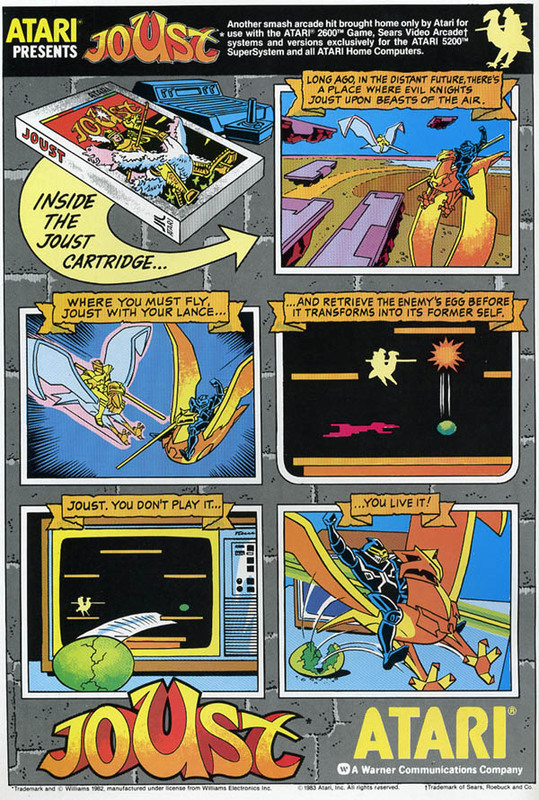 This time I found on a real gem: an Atari ad for Joust from the eighties: so kitsch! I decided to modify it a bit to add it on the back of the DVD sleeve instead of the usual 4 screenshots. Edited by Felyx, Wed Feb 18, 2015 8:41 AM. 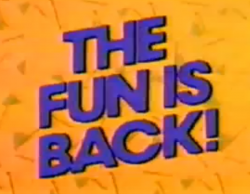 The_fun_is_back_from A-T... oh wait, from C-Y-R-A-N-O-J! Excellent work on all these covers, Felyx! *warning* its very rough (did I mention I'm crap at editing samples?) and also not working quiiiiiite right. Hey I loaded this up, Joust with sound now for the Jaguar? Oh yeh!! The samples (which I get the impression are stand in) basically all fired at the right time. We had the opening "music" which was about as much music as the Arcade had. You had the hitting effects, teleporting, clashing, picking up effect, award effect, the effect when the floating islands disappear, and the Dactyl sound effect. You had the running sound effect when your mount is running on the ground but no flapping sound effect. 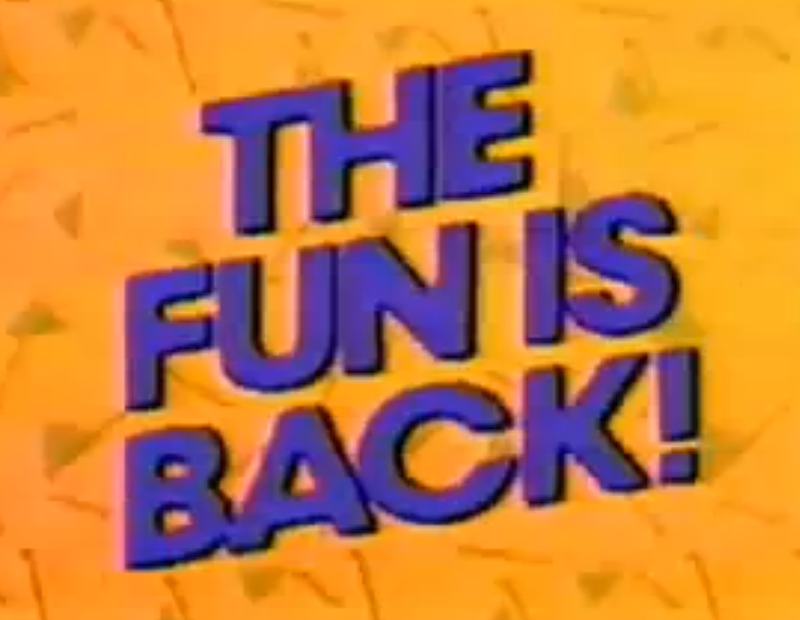 My only suggestion to whoever brings in the final sound samples is this: The ST version graphically was close to the Arcade and the gameplay was fairly close. 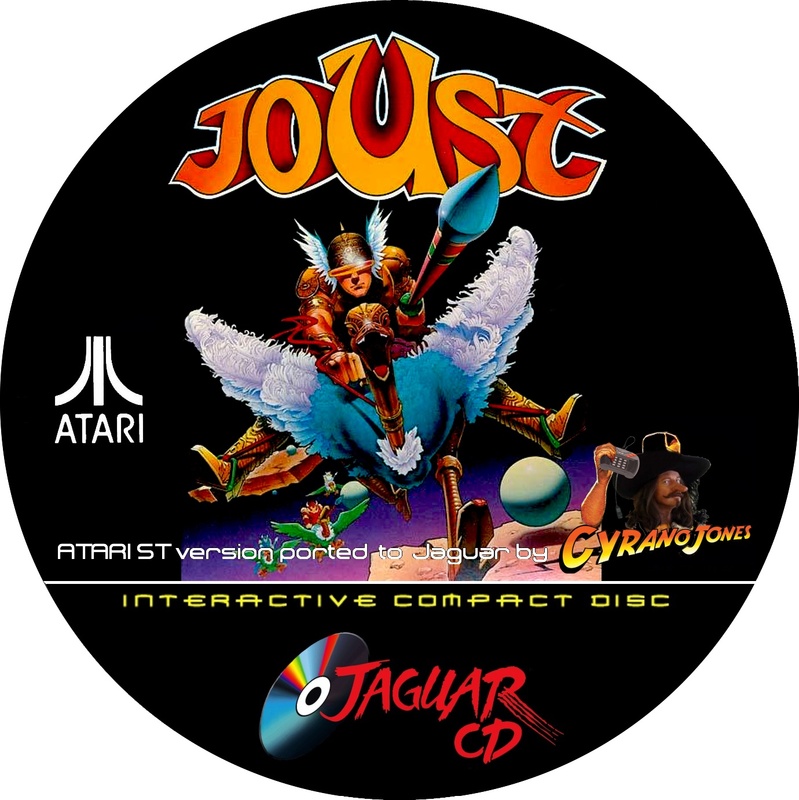 The sound in the early ST games let's admit (especially with Joust and Star Raiders) was sub par. 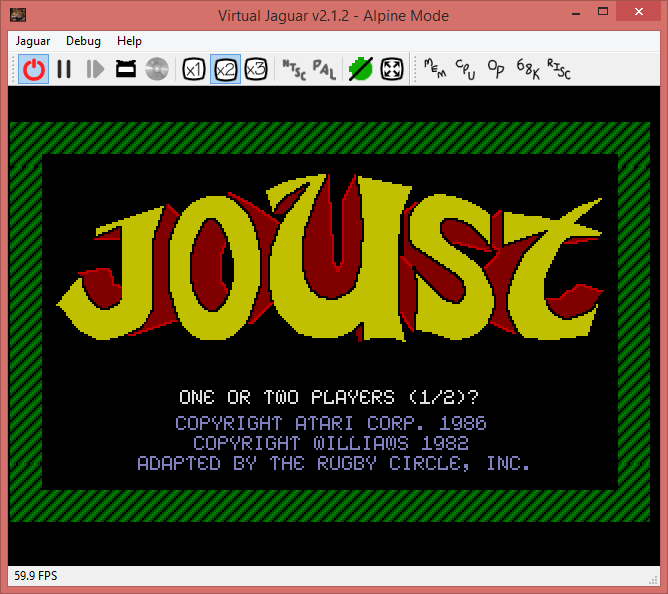 The hitting sound effect in Joust for example sounds like a hitting effect on an Intellivision. Love the Intellivision and on a 10 bit system (or whatever it is) that sound effect is great. On a 64 bit Jaguar, not so much. So if you have to add samples anyway, why not sample the Arcade effects (or a better version). 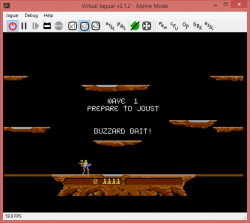 Hell, even the Atari 8-bit sound effects were better than the ST effects and I'd be happy to make samples from that. Then you can grab the arcade and a8 samples for the equivalent sound effects, and I'll add a menu so you can select how you'd like the game to sound (ST, A8, Arcade) ? Lets get some teamwork here! A lot of these sounds are pretty good. What was "JoustOc" supposed to be? I don't hear much from that one. If we make another set is this the way the files need to be named? Can't remember what 0C sounds like - I'm at work now. If you create a new set please keep the last two characters the same (so,01-0F) so I know which ones to match them with. I'd suggest ARC_0x.WAV or A8_0x.WAV as the format. Awesome. Will see what I can do. We could even have a 2600 set. Actually the sounds were surprisingly better than I remembered. From the ST sounds, here is the best I was able to figure out on what they do. I might just put the Atari8 Joust sounds and say "Egg Open sound" ect. Edited by doctorclu, Mon Nov 9, 2015 9:08 PM. I'll check them when I get in, some of the sounds might not be used at all.